Are you considering moving from pews to church chairs at your place of worship? Have you found that church chairs may actually be more beneficial to your congregation as well as the setup and layout of your church facility? If so, knowing where to go for the perfect church chair is a huge part of ensuring a successful transition. Luckily, Bertolini offers the best USA built church chairs in the state and throughout the country. No matter the style, the amount, or the specific needs of the church, Bertolini can provide a great product that will last a long, long time. Not sure if moving from pews to church chairs is right for your church? These 5 benefits of church chairs may help change your mind on the matter. Traditionally, many places of worship provide pews for their congregation to sit in rather than church chairs. Unfortunately, pews are not the most comfortable option as they are often designed as hard, stiff-backed, wooden benches that can fit multiple church goers in one row. Many people find pews to be uncomfortable, and many find them to be harmful if they have back or other physical health problems. 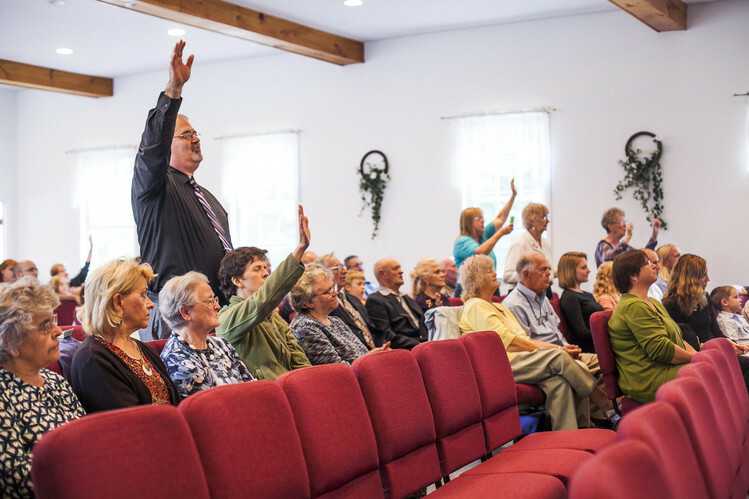 Due to these dismal seating arrangements, some churches may see attendance fall or a very fidgety audience during their sermons. With this in mind, making the switch to church chairs comes with many benefits that are good for the congregation as well as the church. The following 5 are just a few benefits of why moving from pews to church chairs could be great for your church. Many churches feel that comfortable chairs are actually an extremely important part of the church experience. With church chairs, the congregation is saved from stiff backs, aching legs, and strained necks. The Bertolini church chair models offer comfortable, soft seats and backs that also provide excellent support for individuals with lumbar issues. When your congregation is feeling better, they’re more likely pay better attention throughout church while simultaneously enjoying themselves. Pews can make both an awkward and uncomfortable experience for some church goers as they don’t provide much personal space. On an especially crowded day, you may find yourself packed into a pew with little to no breathing room. For many people, this can be distracting during the service, and may cause discomfort of a different kind than just painful seats, such as anxiety. Church chairs allow each congregation member to have their own space while still being a part of the congregation. Bertolini even offers church chairs with arm rests that slightly increase this feeling of personal space that some people need to feel comfortable and at ease when in a crowd. Bertolini church chairs are locally sourced and made with only environmentally sound materials. With this in mind, moving from pews to church chairs specifically provided by Bertolini will ensure that your church is taking a stand for the protection of the environment. Only the best materials make into these chairs, ensuring that they will be strong and last long. With pews, there’s very little you can do when it comes to rearranging the sanctuary setting. Pews are fixed seats that can keep people separated, making things like small groups, or even meet and greets, on Sunday morning a little difficult. With church chairs, you can rearrange the sanctuary setup however you like, making a truly flexible room that can be changed up whenever a change is needed. If the sanctuary space is being used for small groups, chairs can be placed in a circle facing one another, or in any other arrangement to suit your needs. Whether it’s a smaller event, a larger event, or some special circumstance, church chairs are much more adaptable, making things much easier overall. When moving from pews to church chairs, you also get the advantage of a long-lasting piece of furniture. Not only are the Bertolini church chairs made to last using only locally sourced materials, but they can last long with the life of your church as well. When church plants are young, it is common for them to move around a lot, from space to space until they find something permanent. Unlike church chairs, pews are permanent and cannot be moved if the church is able to find a bigger, better space to accommodate their news. Church chairs, however, can be stacked, stored, and shipped with ease, making them additions that will be with your church for a long time. If you’re still unsure about moving from pews to church chairs, you might want to visit some churches that use church chairs regularly. Doing research, exploring, and comparing can be extremely when making a large decision. If you decide that church chairs are better for your church, however, Bertolini is just a call or click away!